Storage that's hard to reach—the rafters in garages, the top shelves of kitchen cabinets, bedroom closets and tall bookcases—is a common problem in homes, and sometimes in offices. As a professional organizer, I recommend step stools (or short ladders) to my clients all the time, so they can make use of the storage space available to them, without standing on chairs and risking their safety. And different designs serve different situations. Sometimes the space allows for a step stool that does not fold, but rather sits out and becomes part of the decor. The step stool above, from Infusion Furniture, was designed for a loft-style apartment, for an end-user "who wanted a stool that was interesting and elegant enough to live in the kitchen and not in the closet." The handle makes it easy to carry around to different locations. 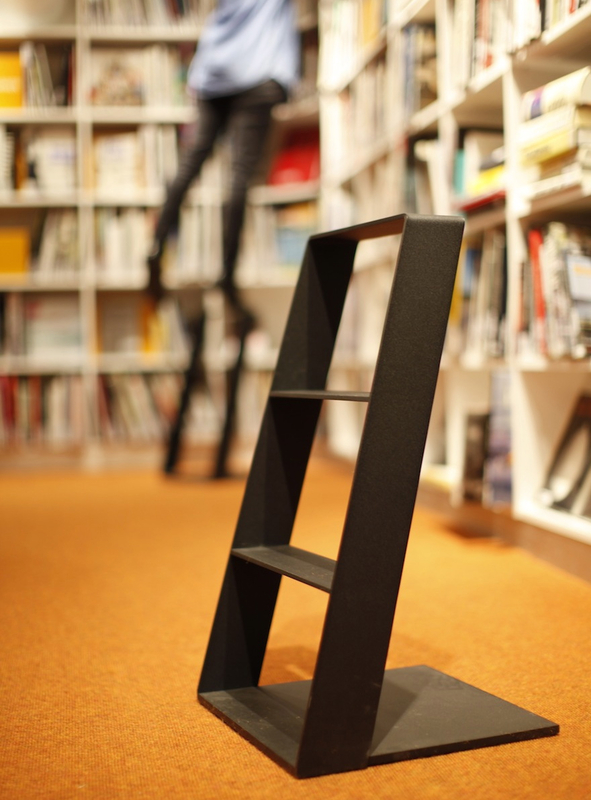 The Heaven stepladder, designed by Thomas Bernstrand and manufactured by Swedese, is made of lacquered aluminum sheet metal. There's no second side to provide support; instead, the base does that. This might make some end-users nervous, but others will love the look. That photo is by Fredrik Sandin Carlson. 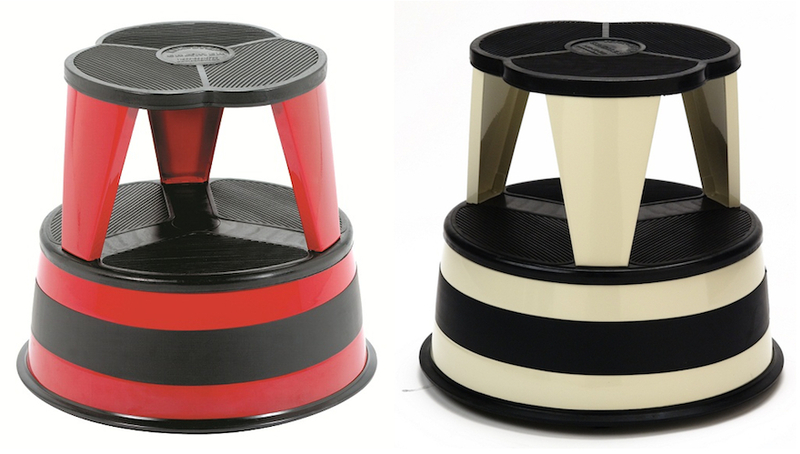 And if we're talking about step stools that don't fold away, the Cramer Kik-Step has to be included. This one has been around for 50 years, and it's often found in libraries—but I know someone who uses it in her pantry. The Kik-Step has hidden casters to make it easy to move around on most floors; the casters retract when someone steps on it, and the stool locks into place. The bumpers keep it from scratching the walls. It's made of steel, and supports up to 500 pounds. 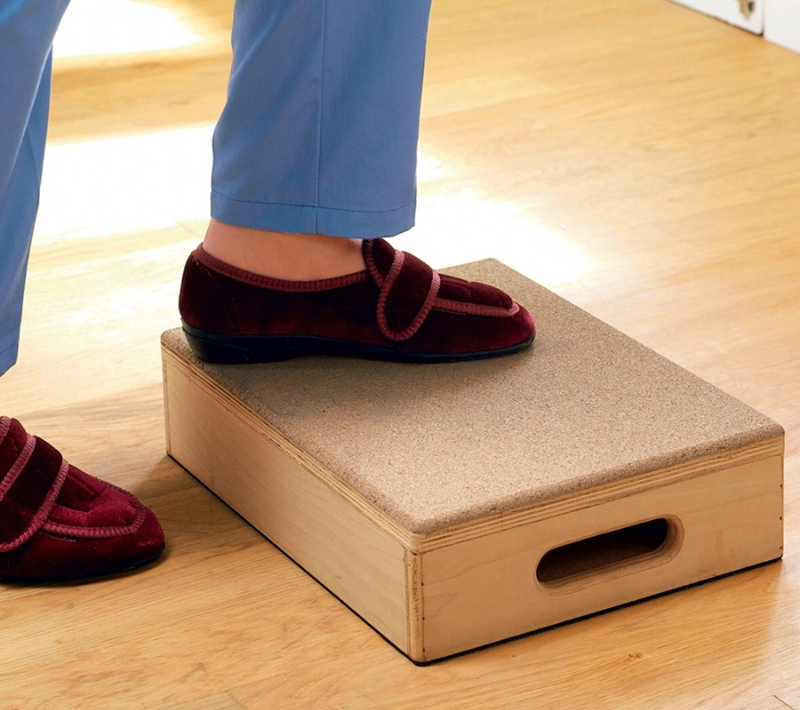 But many end-users, especially those in small spaces, will want a step stool that does fold up. The Lucano step stools, created by Metaphys and Hasegawa Kogyo Co., will each hold up to 220 pounds. The step stools are made of a combination of aluminum and ABS; end-users comment that the light weight makes them easy to move around. One drawback: The grooved steps are too narrow for some end-users; the bottom two steps on the 3-step ladder are just 2.75" deep. As someone who always feels a bit unsteady on step stools beyond one-steppers, I appreciate the handrail on the Trappestigen, designed by Thorsen Møbler. Made of wood, this one handles up to 440 pounds. A nice touch: It comes with a fitting to allow it to be hung from the wall. 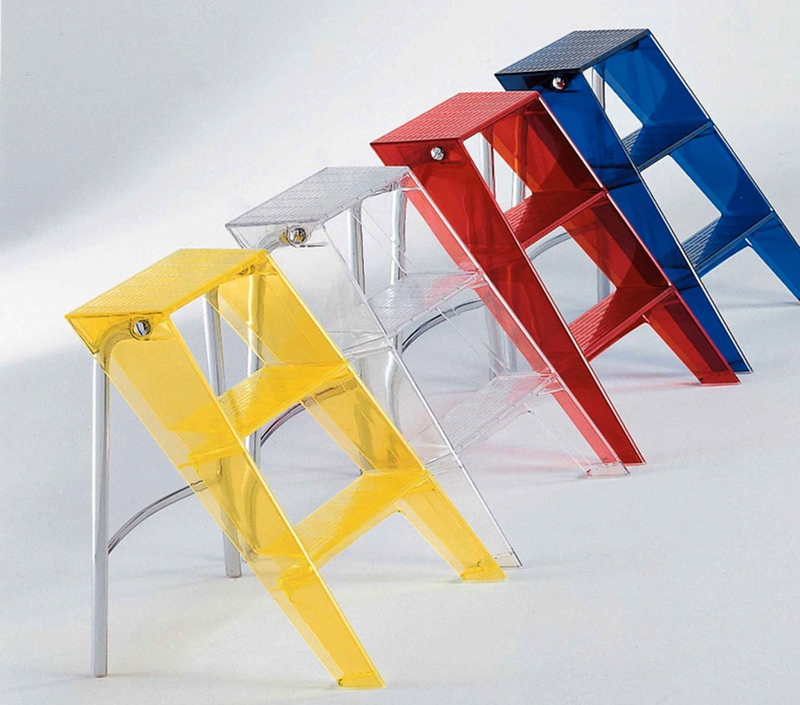 The Upper folding ladder, from Kartell, was designed by Alberto Meda and Paolo Rizzatto. It's made from an unusual choice of materials; the frame is made of chrome-plated steel, but the rest is polycarbonate. It doesn't look like it folds, but indeed it does. It holds up to 570 pounds. Multi-purpose furniture is great for those in small spaces, or any end-user with an interest in minimalism. 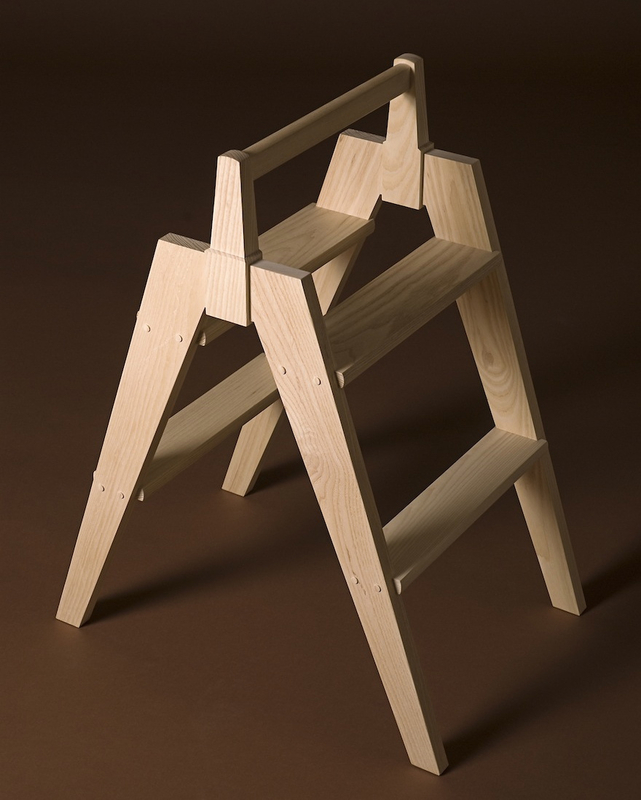 This design from Object Creative combines a folding step ladder and a stool. 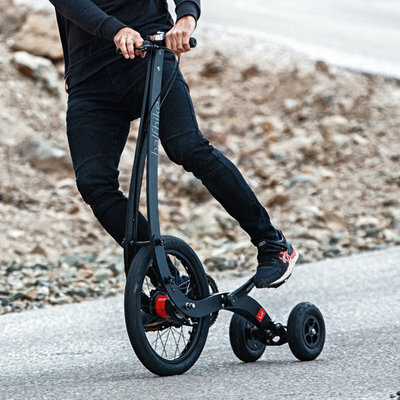 It folds up very compactly—but, as a trade-off, the steps seem narrow (as well as slippery). 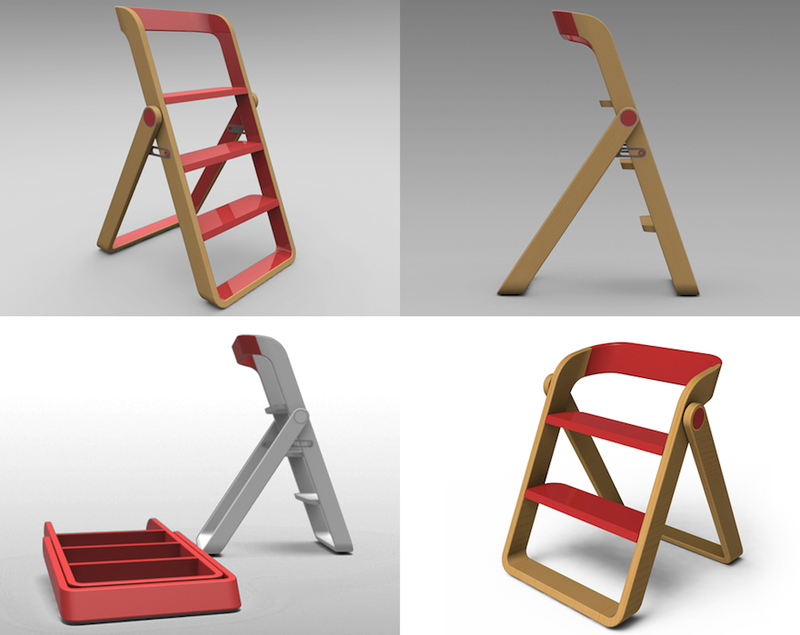 Another approach to the chair/folding step stool combination is the USIT from Altrex, designed by Maarten Olden. 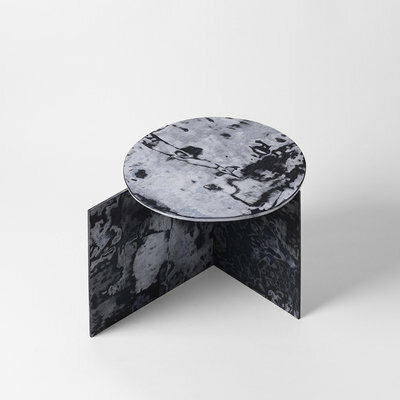 Made from aluminum and wood, it's "a chair safe to climb on." And the steps here are quite large, and have anti-slip ribbing. Good-looking step stools have their place in end-users homes—but sometimes good looks take a back seat to other considerations. 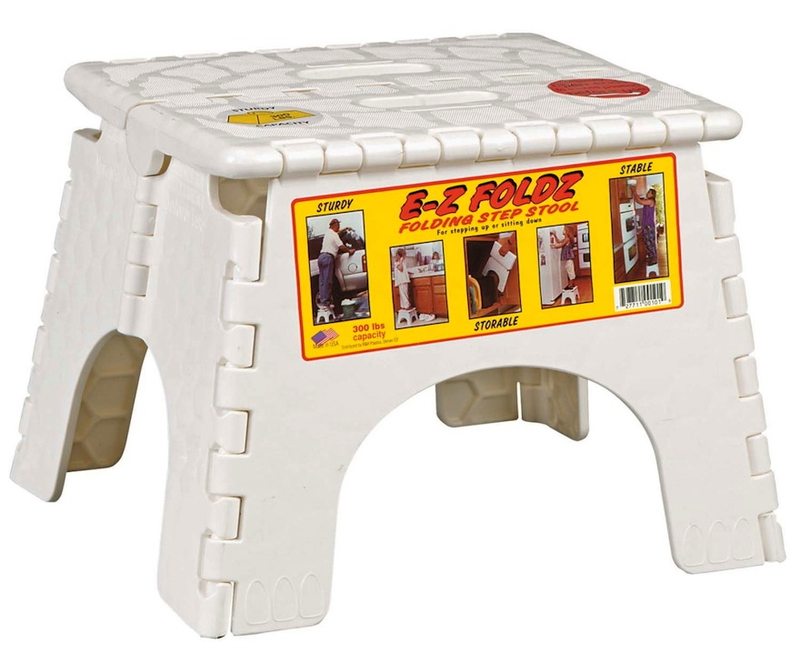 While it's not attractive, the EZ Foldz step stool is extremely practical. It folds up to just 2" wide, so it's easy to store. It opens easily and feels sturdy; it can handle up to 300 pounds. It holds up well, and it's easy to clean; people use it almost everywhere, both inside and out. 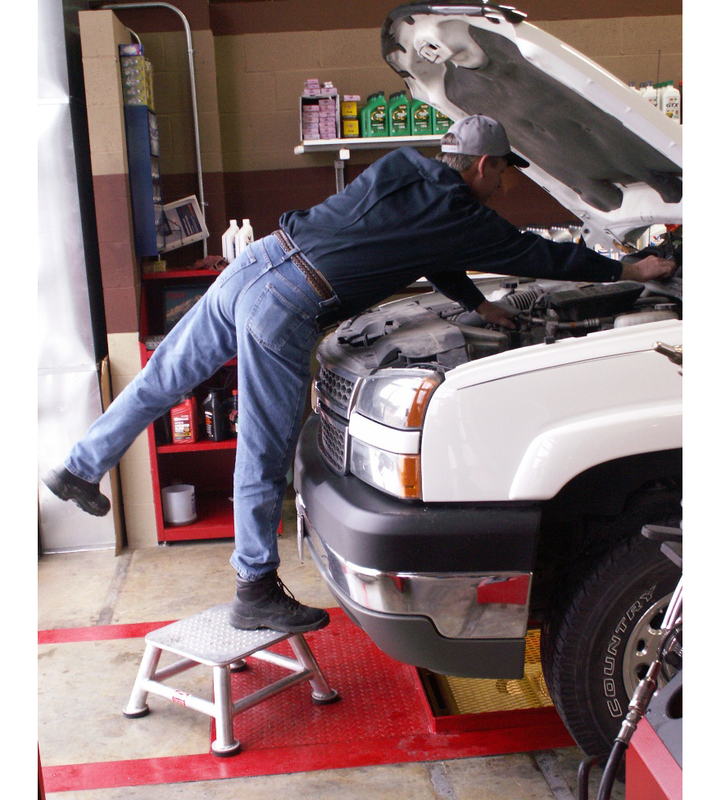 Other step stools seem designed specifically for the garage or similar environments; one of those is the Technician Step Stool from DevonLube. The rubber foot pads, which help avoid skidding, are "oil-resistant" and easily replaced if need be. That top tread is an anti-sip feature, and the base is wide and stable. While it was designed for lube facilities, I can see this step stool being used in all sorts of less-than-pristine workspaces. For something taller, there's the Hailo Championsline folding steps. I especially appreciate the extra deep non-slip treads. With the double-sided steps, it's a bit wider when when folded up than some other designs are. 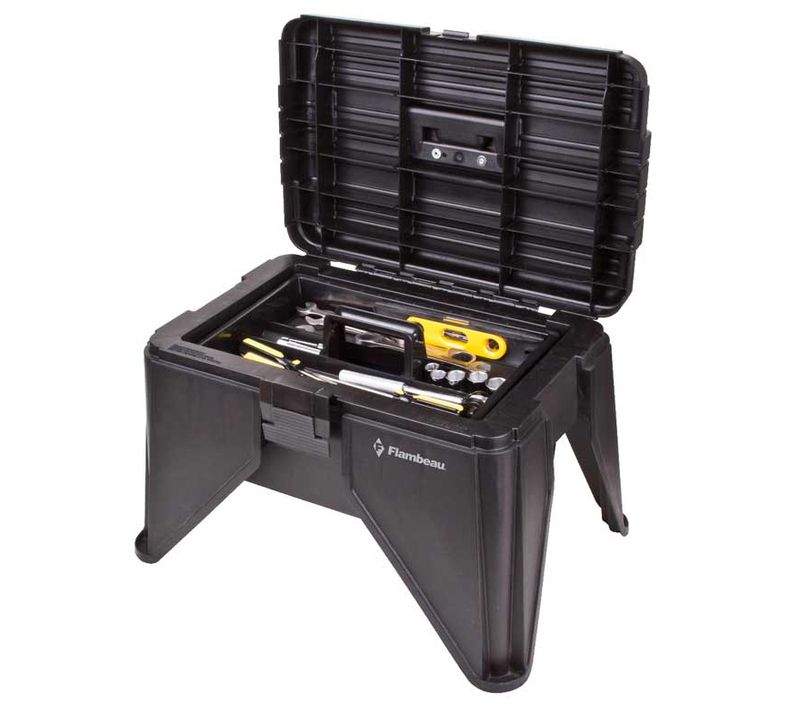 The Flambeau Stand 'N Store Stool is another interesting dual-purpose product. Besides being used around the house, garage or workshop, it could be tossed into the car or truck for those who sometimes need a step stool as part of their on-the-go toolset. 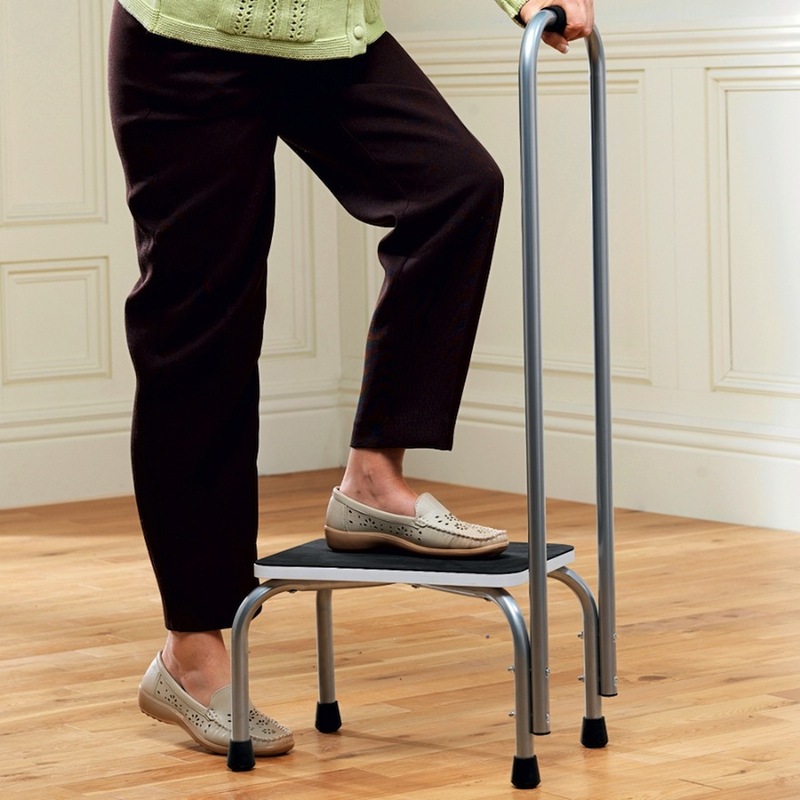 Another kind of purely practical step stools are those especially designed for end-users who have significant issues with balance: some seniors, for example. One challenge here is the trade-off between a super-sturdy product and one which is lightweight enough to be readily moved from place to place, as needed. 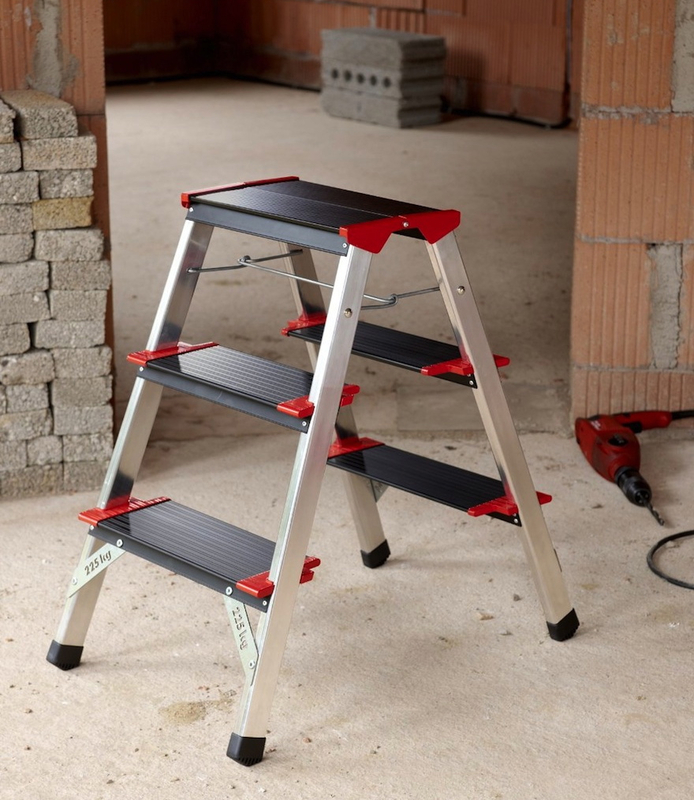 This step stool with a hand rail and a large slip-resistant platform weighs 8 pounds. Another advantage of the long handle is that the end-user can move it without bending down. Another way of handling balance challenges is to have a very short step (3 to 5 inches tall) for those who need just a small boost to reach things. This step with a cork top and a rubber base was designed for both getting into bathtubs and reaching things in cupboards. Cork is a non-slip material, and you'll see cork bathmats because the cork dries quickly and resists mold, mildew and bacterial growth—so it seems like a good topper for such a step. And here's one final special-purpose stepladder. End-users who don't want to buy both a 2-3 foot stepladder and a taller A-frame ladder can get an adaptive stepladder from Little Giant. I was also delighted to realize these work on stairs! My favorite step stool is IKEA's Bekvam. I would have ONLY Bekvams to furnish my apartment if I could.